Hurricane Matthew: Volunteers In Haiti Try to Figure Out How Many Houses Were Destroyed : Goats and Soda Hurricane Matthew hit the coastal city dead-on. A grim tally is underway to figure out how many homes were destroyed — and how much help is needed to rebuild. 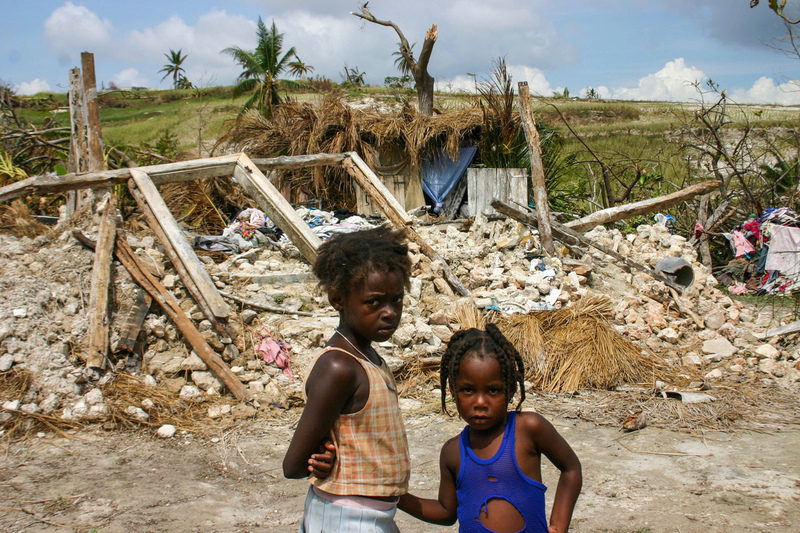 Girls stand in front of their destroyed home in the Dumont section of Port Salut, Haiti. They're now living in the thatched shack that's directly behind the rubble of their home. The Dumont section of Port Salut on Haiti's southwest coast is spread over rolling green hills that used to be rich with coconut, mango and banana trees. But Hurricane Matthew toppled most of those trees. It tore apart the simple concrete and sheet-metal houses in the area. It killed livestock, destroyed crops, smashed businesses. Emmanuello Charlien is part of a team trying to tally the damage of Matthew here. Charlien points out a pile of metal that used to be a cellphone tower. "Natcom, which is a cellphone company, used to have a tower right there," Charlien says. "The tower fell on someone's house. And it even set a fire right after this." Charlien, a 23-year-old law student at the local university, is one of about 200 volunteers who've been pulled together by the mayor's office to conduct this census of the destruction across Port Salut. 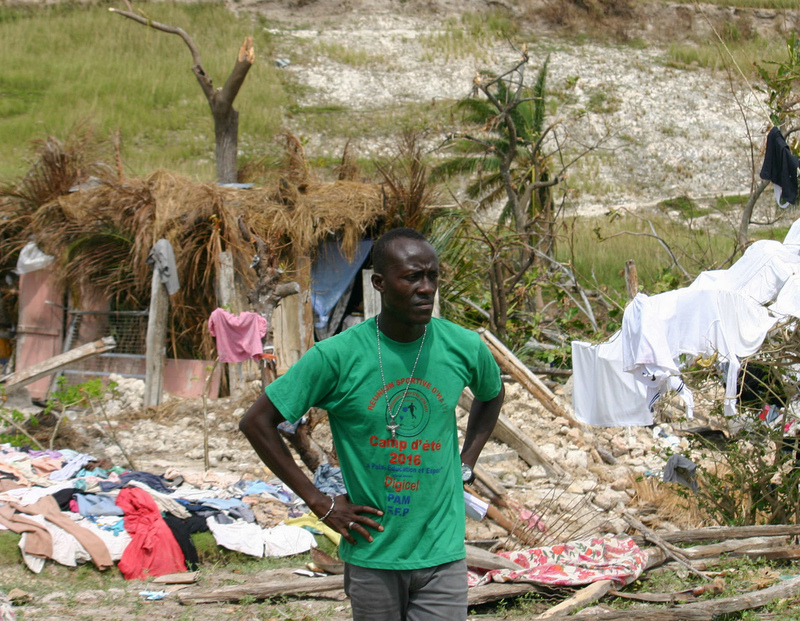 Emmanuello Charlien, a volunteer, assesses hurricane damage in Port Salut. He walks down a small path that's blocked by trunks of fallen palm trees. After scrambling over them, Charlien walks up to a pile of smashed concrete with a few wooden timbers sticking out of it. "So, this is a destroyed house," he says, pointing to the pile of debris. "And they built a shelter here to stay in, you can see." The shelter is pieced together out of scraps of sheet metal, wood and palm leaves. "The investigation's focus is really on how many houses are totally down, and how many of them can be fixed," Charlien says. "This way the mayor would have a greater sense of what can be done, and what should be the approach of any assistance to the people of this area. "Because we know there's no way the local government can address the needs of all the people nearby. It's going to have to be the central government. So that's why we need to have an exact sense of the losses, so we know what to ask for and where to give the priority." In this section of the municipality there are supposed to be 350 houses. So far this crew of volunteers has only found three that survived the hurricane intact. Nelson Sony's house fell into the "partially damaged" category on Charlien's census. Sony, however, says in the midst of Hurricane Matthew's 145-mile-an-hour winds, the house felt like it was going to "explode." The storm ripped the roof off much of the four-room house but left the concrete walls standing. Sony, his wife and five children fled the house and lay down in an open field for the worst of the storm. Nelson Sony in Port Salut says he thought his house was going to "explode" around him during Hurricane Matthew. Much of the building was destroyed. "We were scared, but what could we do?" Sony says. "We just had to cope with that because we were so close to death just by watching this, it was just praying we could survive this." Sony says he has no idea how long it will take to rebuild his house or where he'll get the money to do it. 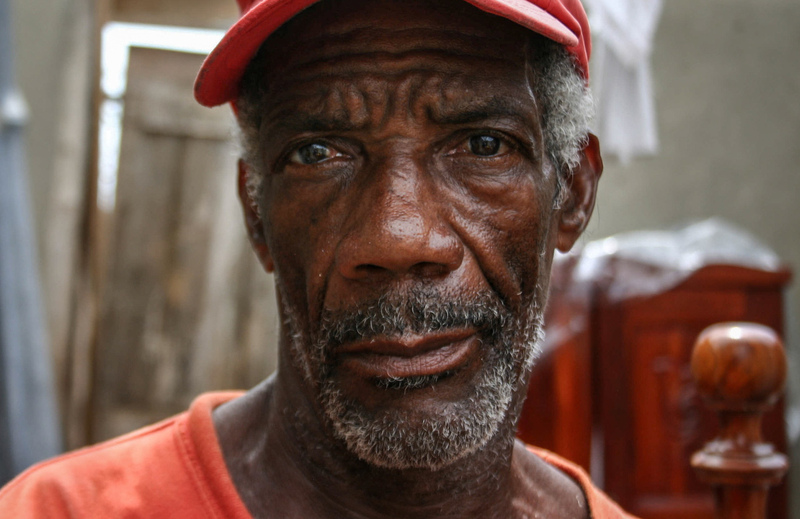 Given that most of the people here are in a similar situation, Charlien says the money for reconstruction is going to have to come either from the national government or abroad. "The Haitian government has the goodwill to help its people. But between the means and the actual resources to make it happen, that's a different story," Charlien says. Port Salut Mayor Wilson Dena Marie agrees that there's no way these communities can rebuild quickly on their own. But he doesn't want to see a repeat of the international relief effort that followed the 2010 earthquake. He says nongovernmental organizations, or NGOs, came in and distributed whatever they wanted, built whatever they pleased, regardless of whether it was what the local community really needed. The mayor says it has to be different this time. "Everything has to go through the municipality," the mayor says about any incoming relief supplies. "Because if you as an NGO just show up with aid and start giving it away, you might not find ways to address the people who need the aid the most." The mayor wants to build entirely new villages with piped water, sewers and electricity for everyone. But in the short term, the mayor says his biggest priority is getting clean water for residents. A lot of people currently are getting their water from rivers and streams. There's only one road through the hurricane destruction to Port Salut. The mayor recently tried to ship in a truckload of water, but it was looted. "Just yesterday it was attacked and people just got all the water on the way," he says. "And I didn't get the chance to bring the water to Port Salut." While he's trying to figure out how best to get aid to his people, and while the mayor has grand visions for what he'd like to see his city look like in the future, the challenges of both remain huge.